Orleans – The banks of the Loire will be alive with activity from Sept. 23 to 27, as Orléans celebrates the glory of the river’s inland waterway fleet. The hugely successful Festival de Loire, held bi–annually, is Europe’s largest event of its kind, drawing some 600,000 visitors from across the world. So come and join in the buzz and five fun-filled days of festivities, all free-of-charge, honouring the historic city and its legendary port, once France’s main river port and the hub of a busy and prosperous merchant marine trade. King Francis I, an early champion of commerce and exchange, would have been proud! The agenda includes a gathering of some 700 boats – toues, gabarres and other colourful and exotic flat-bottomed boats, with or without sail – which will travel to Orléans from all over France, 450 artists, poets, musicians, street performers and hundreds of displays of local crafts and culinary specialities. You can start getting into the swing of things by visiting the Musée de la Marine de Loire at the Château de Châteauneuf-sur-Loire, the Musée des 2 Marines et du Pont-Canal in Briare, or the intriguing collection of fishing paraphernalia at the Château de La Bussière. If the outdoors is your cup of tea, take a day or evening excursion on a traditional boat along the royal river or rent your own houseboat – no permit required – to explore the region’s amazing patchwork of canals. Follow this link for more info…. 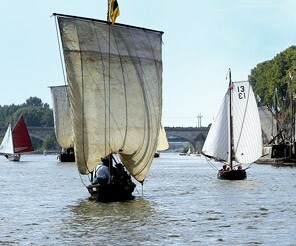 This entry was posted in Arts / LifeStyle / Travel and tagged Festival de loire, Loire Valley, Orleans France, River Loire. Bookmark the permalink.